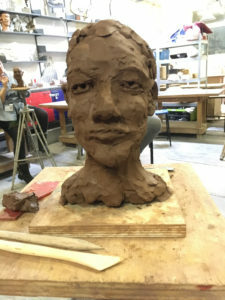 I have just finished a ten week Life Sculpture course at Bath College. It was one of the best things I’ve done for a long time. I had no idea what to expect as I have done nothing like it before. Never done Life Drawing. Not made anything in clay since primary school – and that was a coil pot which cracked on firing. Never made a head, nor a wax mould or used plaster of Paris. It was a totally absorbing activity – what I imagine is a form of mindfulness. You empty your mind. No wandering thoughts, worries, critical voices. No chit chat. In the moment. Just pure art and aesthetics. What I saw and what I felt with my hands and shaped with my fingers. Of course, it doesn’t look anything like the female model we had – with her delicate features and long hair in a pony tail. For some reason mine came out looking like the actor Geoffrey Palmer, then morphed into Michael Portillo as I attempted to make it look more feminine. I got very attached to my head. We made some sort of connection. Funny how once you put in the eyes, it becomes a person, looking straight back at you, and I didn’t want to spoil it by trying to change it. It is what it is. And my tutor complimented me on my work. But I expect he does that to all his students! Week 4 – we started another sculpture – a full reclining figure. Now that was a challenge over the next six weeks. 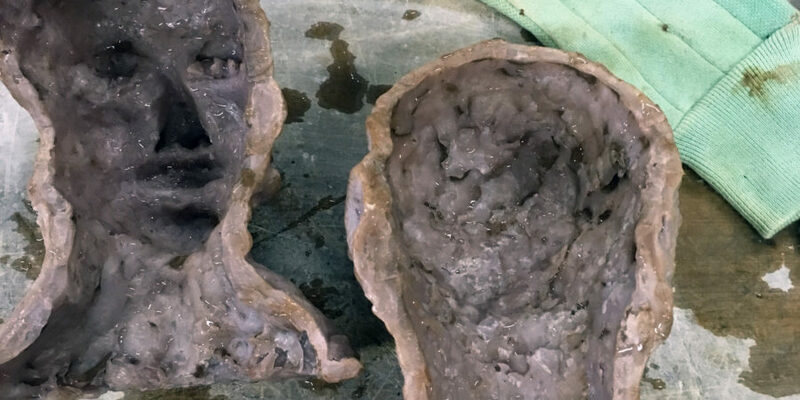 I decided to model in air dry clay – which meant no hot wax mould making – no digging out all the interior clay (as you can see in the feature image). My finished figure is still drying on a shelf in the studio. It was too heavy to carry home (mainly due to the board on which it sits) so I’ll have to go and see how it is after Christmas when the college opens again. This time my finished piece definitely looks like the female model.